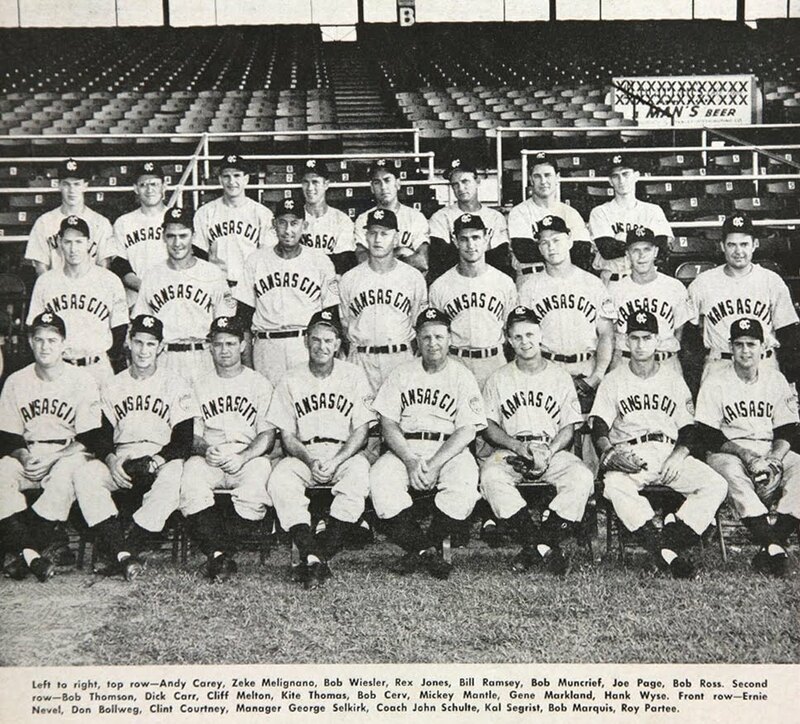 Sixty years ago this July 16, on a warm, foggy evening, a small crowd of 3400 came to watch the Brewers host the Kansas City Blues, both teams tied for second place in the American Association league. Fans that night couldn’t have known they were about to witness a glimpse of future hall-of-fame greatness. It happened to be the first minor league appearance that season for a 19 year-old from Oklahoma who’d been wearing pinstripes just days before. Days later in Milwaukee, the fog was so thick, Mantle quipped, "I may need a mask out there tonight." 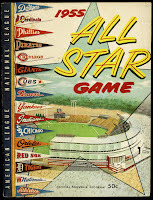 That evening, the switch-hitter batted lefthanded and went 1 for 4, his only hit a bunt single to the first-base side. Those in attendance got to witness Mantle at his blazing best: among the fastest to ever play the game (it's been said that Mantle ran from home to first in 3.1 seconds when batting from the left side). 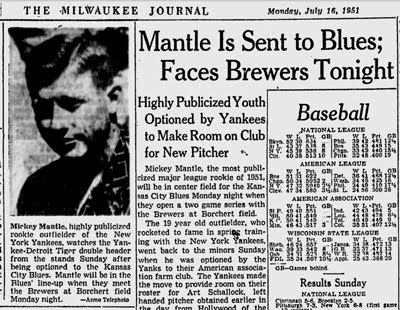 The following evening, after word had spread that Mantle was in Milwaukee (both the Sentinel and the Journal had highlighted Mantle's appearance), the crowd swelled to over 10,000, and Mantle went 0-4. In fact, he played so poorly for the next couple of weeks, he considered quitting baseball altogether. Luckily for baseball, he didn’t. 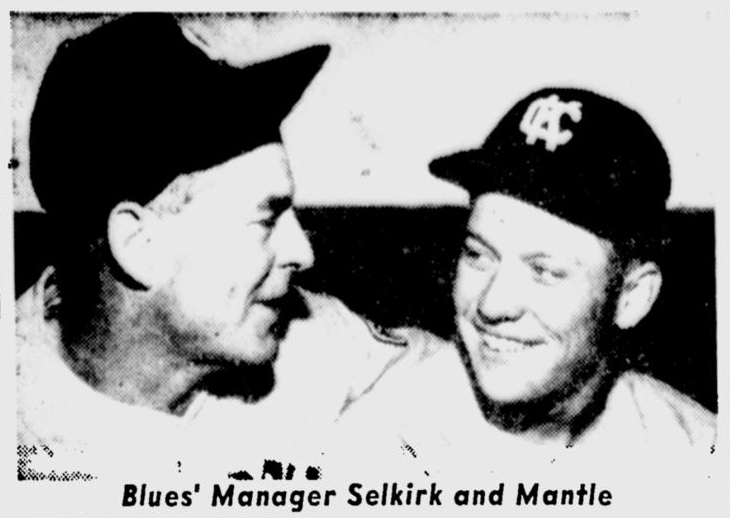 And luckily for the Brewers, by the time they faced the Blues again, Mantle was already back up in the majors, having hit .361 with 11 home runs and 50 RBIs during his six week stint in the minors. He was never to return. That October, during game 2 of the '51 World Series against the Giants (who'd made it there after Bobby Thompson's "Shot Heard 'Round the World") Mantle caught his spikes in a drain in right field while trying to avoid a collision with Joe DiMaggio, on a ball hit by another celebrated rookie, Willie Mays. It was an amazing convergence of three of the game's best, a linkage of the past with the future. The play would also link Mantle's past with his future; he blew out his knee, and would never run the base paths again without pain. Although Mantle's injury may have kept him from realizing his full potential, it didn't keep him from achieving greatness: he would go on to win three MVP awards and seven World Series titles. 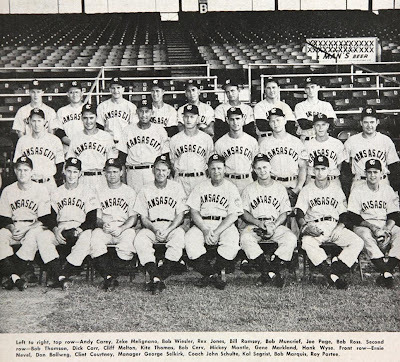 As for Milwaukee, the Brewers and Borchert field gave way to the Braves and County Stadium in 1953, but Mantle would return to The Cream City again in 1955 as a Yankee All-Star, almost four years to the day of his appearance at Borchert Field. Mantle wasted no time getting the American League on the board, hitting a three run home-run in the first inning. In his next game in Milwaukee, he hit yet another home run, this time in game 3 of the ‘57 World Series, a 12-3 whooping for the Yankees over the Braves. 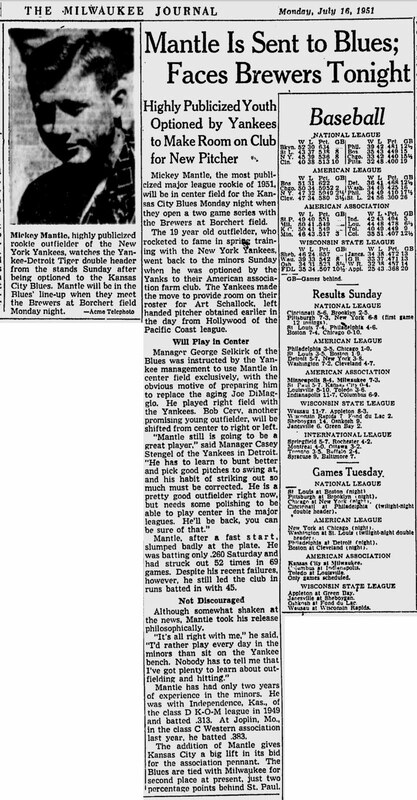 For those in attendance that fall day at County Stadium, perhaps a handful could remember seeing Mantle six years earlier, when he was a struggling ballplayer with lightning speed and limitless potential. A potential, it would appear, that was now fully realized. Paul Heinz is a musician and writer who's completed seven CDs of original songs, mostly in the rock/pop vein, and he's putting the finishing touches on pop CD for teenage singer, Maddy Meyer. He writes a weekly blog, his essays have aired on 89.7 WUWM in Milwaukee, he won the 2006 James Jones Short Story award, and he's on the hunt for an agent to represent one of his two completed novels. All of his music and essays can be found at www.paulheinz.com. Paul is currently playing keyboards for the fabulous rock and soul band, The Chi-Town Showstoppers. Go to www.chi-townshowstoppers.com for more information. Great post! 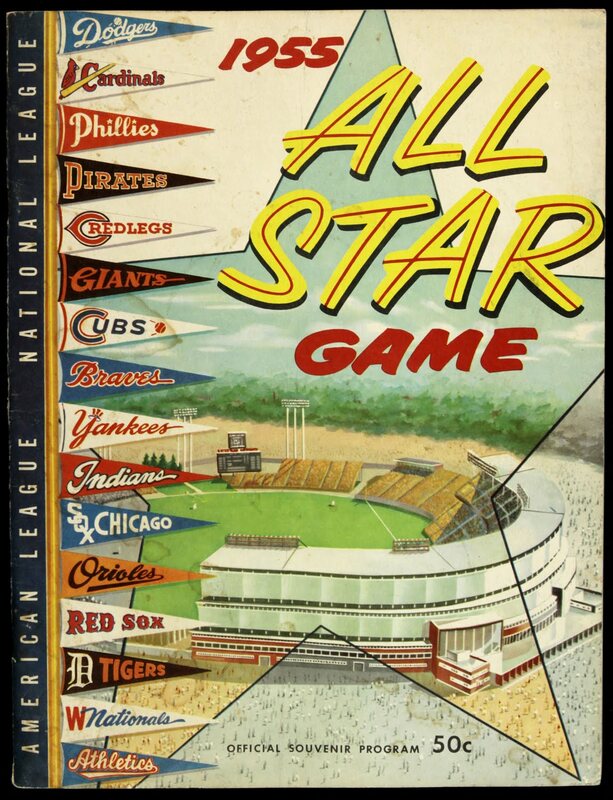 I had no idea that Mantle played in Milwaukee before the '55 All-Star Game. Neither had I, which is why I was so glad when Paul brought this article to me.